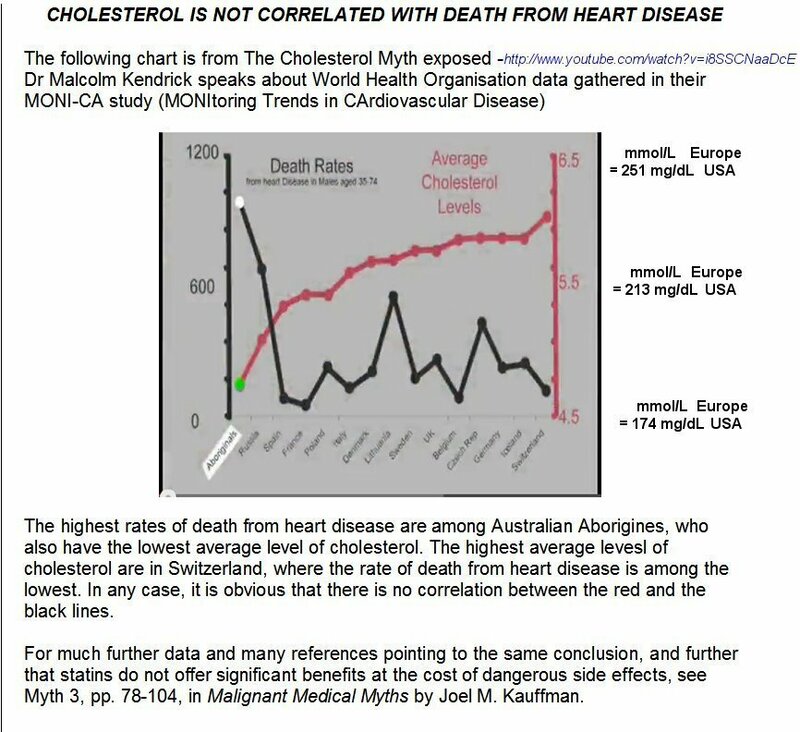 There is no convincing evidence that what is currently regarded as “high cholesterol” is harmful; rather, cholesterol is actually good for you at levels (200-260) that current practices seek to lower. Lip service is paid by official agencies and by drug advertisements to using diet and exercise as the first way to lower cholesterol. In practice, innumerable people are taking statins to that end. 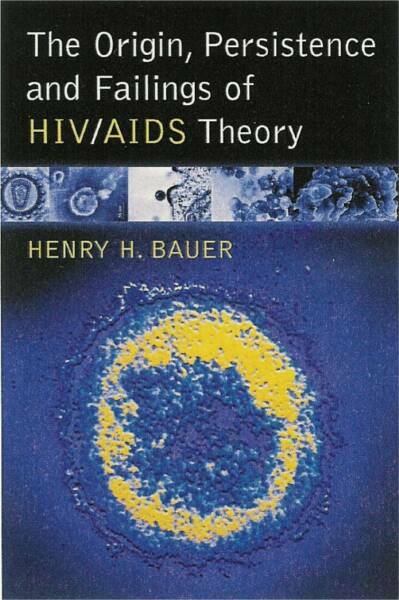 “Bayer had their statin (cerivastatin, Baycol) approved in June 1997. Within 4 months, Bayer knew that it could cause rhabdomyolysis — muscle wasting and death. But this risk was not noted in the drug’s package insert for another year-and-a-half, and the drug was withdrawn only in August 2001 . . . after some hundreds of acknowledged deaths” and perhaps 100,000 or even more actual deaths. All statins do much the same sort of thing. Drugs are called statins because they do that sort of thing. All statins have the same type of “side” effects, albeit not to the same degree; and of course dosage also matters. I am perpetually astonished that anyone would take these drugs after learning about their “side” effects. For instance, one of the daddies of them all, Lipitor, “can cause serious side effects. These side effects have happened only to a small number of people. Your doctor can monitor you for them. These side effects usually go away if your dose is lowered or LIPITOR is stopped [emphases added]”. Note how this official Lipitor website tries to downplay the risks while guarding against law suits by revealing the essential facts. The admission that the side effects can be serious — “fatal” would however be more accurate — is followed by something like a lie about numbers of people affected, and the doubtfully true insinuation that the side effects can be reversed, and the nice-sounding but meaningless and misleading notion that one’s doctor can “monitor” for them. The term “side” effect is in itself altogether misleading. 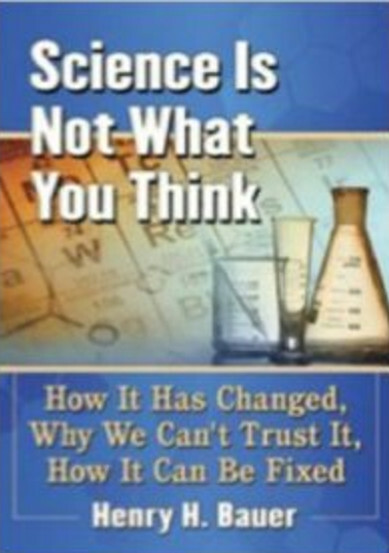 Chemicals do what they do irrespective of what we might want them to do or not to do. “Side” effects are just as real as the desired effect. Drugs are supposed to be approved only if they are safe as well as effective, in other words that the “side” effects are not dangerous enough as to outweigh their possible benefits. Lowering cholesterol has not been shown to be of benefit. Therefore any undesirable “side” effects are too many and too much. But let’s continue with Lipitor’s listing of its “side” effects. Muscle problems. . . . weakness, tenderness, or pain that happen without a good reason, especially if you also have a fever or feel more tired than usual. This may be an early sign of a rare muscle problem [emphasis added]”. Yet “In clinical studies, patients reported the following common side effects . . . . Muscle and joint pain” [emphasis added] and right at the very bottom of the page, “Common side effects are diarrhea, upset stomach, muscle and joint pain, and changes in some blood tests” [emphases added]. In other words, Lipitor doing unpleasant things to muscles is anything but rare. You have muscle problems like weakness, tenderness, or pain that happen without a good reason, especially if you also have a fever or feel more tired than usual”. How on earth is one to judge whether there’s no good reason? How many of us would not feel embarrassed to “ask our doctor” because we feel weaker and more tired than we might like? With a fever, of course one expects to feel weak and tired. And what does “right away” even mean in this context? Do you feel weaker or more tired “than usual” all of a sudden? Anyway, it’s one thing to call our doctor “right away”, but getting through is a different matter. The clinic where my (excellent, cautious, exceptionally reasonable and forthcoming) doctor works has one of those robotic phone-answering systems whose first words are, “If this is an emergency, call the hospital”. Muscle problems are not “side” effects of statins, they are direct effects of statins. When official statements describe statins as well tolerated, what they mean is that the typical weakness induced by statins can be lived with by many people for varying lengths of time. But since “high” or “bad” cholesterol is not harmful, why deliberately induce any muscle pain or weakness at all? The claimed benefits from using statins and lowering cholesterol are based on clinical trials paid for by the manufacturers of statins. Those clinical trials are not be trusted, for a large number of reasons, including that they need be no longer than 6 months and that only two successful trials need be submitted to the Food and Drug Administration — no matter how many unsuccessful trials there had also been! A comprehensive critique explaining why not to rely on clinical trials in general has been given by Ben Goldacre (MD and Guardian columnist) in Bad Pharma. Perhaps the most direct proof that these trials are typically biased is that almost every trial concludes that the drug made by the particular sponsor of the trial is not only safe and effective but also better than its competitors. It’s rather like that fictional place (Lake Wobegon) where all the children are above average: All prescription drugs are superior to all the others, if you were to believe the clinical trials. Even then, those typically biased clinical trials have not shown appreciable benefit for statins. A review of data on 5 common statins showed that they produced an average reduction of mortality risk of only 0.27% per year (Joel Kaufmann, Malignant Medical Myths, pp. 88-90). The risk of non-fatal heart attacks was reduced by only 0.037%, whereas Bufferin reduced that risk by 0.11%, three times better (Kaufmann p. 93). Those numbers are reductions in absolute risk of all-cause mortality, which is the most meaningful for human patients. It’s not much good to reduce one’s risk of heart disease by, say 50%, if the drug we take increases our risk of death by an equivalent amount; death would come just as soon without treatment, just more expensively. But drug companies invariably report reductions in relative risk, not absolute risk. So trials with pravastatin claim a risk reduction of 22% (relative, compared to controls) when the absolute reduction is only 0.2 – 0.5% (Kaufmann, p. 89). The very small risk reduction by statins is nowadays ascribed by many researchers to an anti-inflammatory action rather than lowering of cholesterol; but anti-inflammatory action weaker than that of Bufferin, which is cheaper and much safer. A very general axiom nowadays should be: If you really need to take a drug, take the one that has been on the market for the longest time and has been used by the largest number of people. 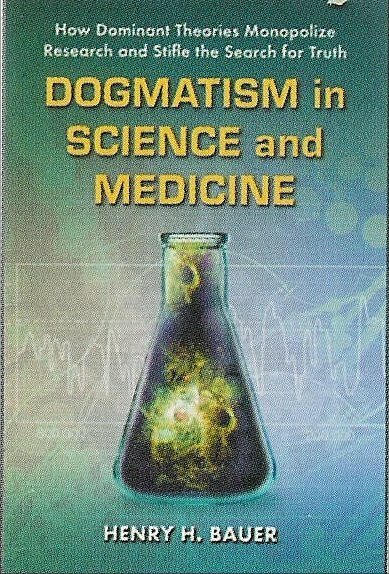 The newer a drug is, the more likely that it will be withdrawn soon after having been first approved (Dogmatism in Science and Medicine, Table 5, p. 240 and associated text). Not only have trials shown that statins are of negligible benefit, the risk of damaging “side” effects is greater at higher doses, another illustration that the “side” effects are just as direct and immediate as the desired effect. Less obviously, “side” effects are also greater when certain other drugs are being taken at the same time; a significant factor since so many people are taking so many prescription and other drugs. This blog is already long enough. A later posting will explain why the “side” effects invariably accompany the cholesterol-lowering, and how the drug companies have deliberately avoided telling statin users of things to do to lessen the impact of the common “side” effects. In recent years there’s been increasing interest in the mechanism and applications of placebos. Well worth reading is The Placebo Response: How You Can Release the Body’s Inner Pharmacy for Better Health (by Howard and Daralyn Brody, Harper, 2000). The Placebo Response offers some insights into this apparent paradox. In any case, placebos are far safer than prescription drugs. 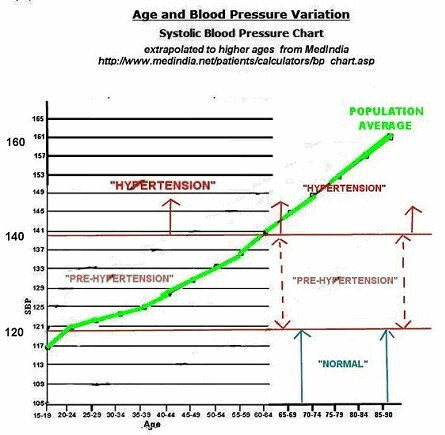 The most irrational and people-damaging use of a biomarker (see “Everyone is sick?”) is probably that perfectly normal levels of blood pressure are labeled “hypertension”. Here’s how I came to learn that. I haven’t had routine annual physical exams for many years and had paid no attention to what my blood pressure (BP) might be. Then one morning I woke to find my left side numb and partly inoperative. Fortunately this turned out to be the most minor of strokes, which had no lasting disabling effect. But when the ambulance had come that morning to take me to the hospital, my BP had been at a level that greatly alarmed everyone — over 200! (systolic). Some little while later I visited a periodontist for “root lengthening” surgery, recommended by my dentist to possibly save a tooth. I’ve long resisted any periodontal work, and was very unhappy to be there. The nurse took my BP and immediately rushed to get the periodontist: I was reading over 190! I knew about “white coat” syndrome, universally acknowledged by doctors and others: BP is always high when one first visits a doctor because of a certain degree of apprehension. Since I knew that I definitely and badly wanted not to be there, I tried to explain that >190 only reflected temporary emotion. But the periodontist — to my enormous relief! — decided that he couldn’t do surgery under these circumstances, and advised me to see my physician as soon as possible. We happened to have at home a wrist-fastened BP measuring device that we had used while caring for a parent, so for several weeks I monitored my BP many times throughout the day. That was surprising and informative. For one thing, this device — like all BP measuring machines — gives instructions to rest for 15 minutes before measuring BP, which of course is not done when one goes to the doctor’s office. At any rate, my BP at reasonable rest is anywhere between 120 and 160. It varies markedly over time, by several units or even a couple of tens of units within 10 or 15 minutes. One evening I had been sitting for more than an hour, engrossed in an exciting TV movie. I hadn’t measured BP for some time, so reached for the machine and had a look. A bit over 200! After the vicarious excitement of the movie wore off, I was soon back to about 160. On another occasion my BP went down from 174 to 140 within minutes. These experiences led me to read up on BP, and to discover that current practices are irrational to the n-th degree. Not only that our BP is routinely measured when we arrive at the doctor’s office, typically in a state of apprehension if not outright fear or panic: much worse is that the very definition of hypertension makes no sense; and that even if it did, there is no evidence that hypertension causes illness or constitutes a illness. The first datum everyone should know, but apparently doesn’t, is that BP increases with age. Not because one is getting ill, just because one is getting older. The second bit of information that everyone should know — but evidently doesn’t — is that the official definition of hypertension takes no account of the normal, natural increase of BP with age. A third datum that doesn’t ever seem to be talked about is that all physiological characteristics vary over quite a range among different yet healthy individuals. What is optimal for one person might not be so for another. Duane Graveline is a physician (MD) who worked in the space program and for more than two decades in private practice. 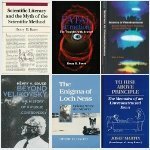 His reading of the research literature as well as his own experience made him realize that current practices relating to BP are irrational and harmful. BP increases naturally with age. A former traditional rule-of-thumb was that normal systolic BP equals one’s age plus 100. Since I was about 80 when I had my minor stroke and my visit at the periodontist, pressures within 10% or so of 180 should not have alarmed anyone. Graveline also describes how stress, mental perhaps even more than physical, can raise BP very much. During their training, Graveline and his fellow budding flight surgeons held their hand for one minute in melted ice: that physical stress caused the BP of these healthy 25-year-olds to rise to an average of 235/135 (systolic/diastolic). A mental test involved simply subtracting 7 sequentially from 100, as rapidly as possible. This raised their average BP to 245/140. If medical practices were evidence-based — a common mantra nowadays — then no one would ever be diagnosed as having hypertension unless their BP, measured after 15 minutes of quiet rest and in absence of mental stress, were frequently and significantly in excess of their age plus 100. By contrast, nowadays hypertension is defined without regard to age, and anyone above 140/90 is said to have hypertension and to be a candidate for treatment, typically with drugs. The consequence is that, according to the Institute of Medicine (Evaluation of Biomarkers and Surrogate Endpoints in Chronic Disease, 2010), about one-third of American adults including 75–80% of seniors have hypertension — even though none of them may have any feeling of being ill. I suggest that this is absurd. And it is more than absurd, it is dangerous to administer drugs to be taken lifelong that are intended to counteract the normal age-related increase in pressure. In fact, half a century ago when diuretics were first being marketed to reduce blood pressure, many cardiologists disapproved, calling it a dangerous experiment and pointing out that increasing pressure with age might well be a compensation for the decreased flexibility of arteries, so that more pressure is needed to ensure that enough blood reaches the extremities as well as all organs (Jeremy Greene, Prescribing by Numbers: Drugs and the Definition of Disease, Johns Hopkins University Press, 2007, p. 53). Several data sets on variations of BP with age all agree roughly with what’s shown in this graph. Some also show ranges of what’s normal, typically 10% or so below or above the population average. I haven’t found specifics, though, for how far away from the average an individual may be without any symptoms of illness. “Normal blood pressure is . . . lower than 120/80 mmHg most of the time. High blood pressure (hypertension) is . . . 140/90 mmHg or above most of the time. If . . . 120/80 or higher, but below 140/90, it is called pre-hypertension. Of course you are: All you have to do is live a bit longer. 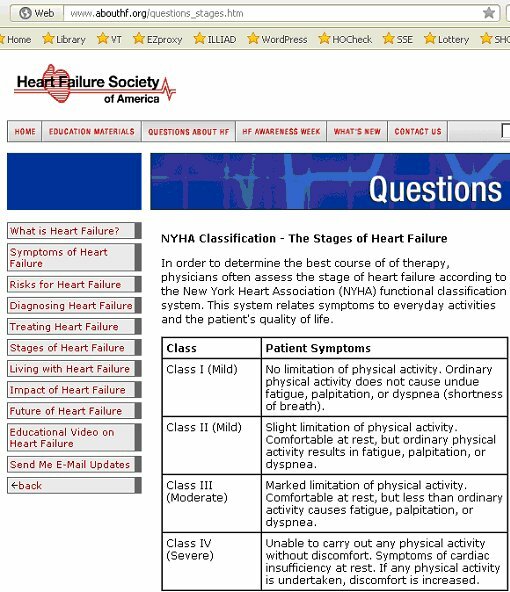 Note that “mild” (Class I) HEART FAILURE has no symptoms at all! Further more, a review of all available data showed that no benefit results from “treating” BP in people with “mild hypertension”, systolic 140-159 and diastolic 90-99 (Jeanne Lenzer, “Cochrane review finds no proved benefit in drug treatment for patients with mild hypertension”, British Medical Journal, 345  :e5511). I have no scientific data as to how many people with those numbers are currently being treated for hypertension, but anecdotes suggest that it is more than a few. the normal increase of BP with age. markedly above the average for a particular age. everyone’s numbers to the same population average. There is no warrant for believing that the lower BP is, the better. BP lower than 140 was actually bad for health. given that the medications are to be taken for life. it is medical (mal)practice AGAINST THE EVIDENCE. I might well have titled this post not “Everyone is sick” but “The ‘health-care’ business is sick and sickening”. Healthy people are being told that they are ill, and they are being treated as though they were ill: they are fed physiologically powerful substances that are toxic to various degrees as well as doubtfully beneficial. Natural conditions, particularly those associated with aging (Seeking Immortality? Challenging the drug-based medical paradigm), are pronounced to be sub-optimal (“unhealthy”, “an illness”) and capable of being improved (“treated”, even “cured”). Illness is judged not by felt or observable symptoms but by biomarkers: things measured by instruments and presumed to reflect some state of ill health, for example blood pressure. Biomarkers have proliferated as research turns up more and more physiological variables that can be measured. Perhaps the earliest to come into general use was blood pressure. Jeremy Greene has described in fascinating detail the story (beginning in the late 1950s) of measuring blood pressure and thereupon defining and treating hypertension. Shortly thereafter came blood-sugar measuring and the defining and treating of diabetes. 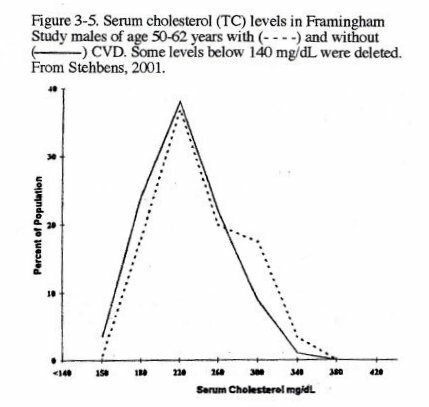 Not long after that, measuring cholesterol levels and seeking ways to lower them (Prescribing by Numbers: Drugs and the Definition of Disease, Johns Hopkins University Press, 2007). The general presumption is that “high” blood pressure, hypertension, is harmful; that it is itself — or at least causes — cardiovascular disease (CVD); that lowering high blood pressure is beneficial to health. Similarly, it is presumed that elevated levels of blood sugar indicate a tendency to diabetes, and that this can be staved off or even reversed by lowering blood-sugar levels, and that this improves health and potential life-span. 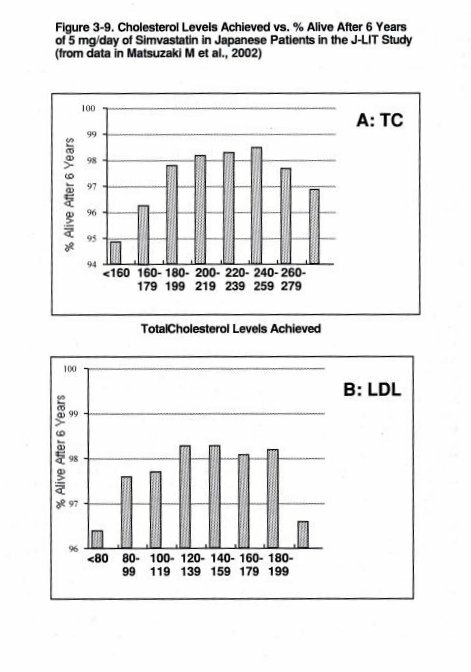 Again, it is presumed that high levels of cholesterol indicate a tendency for plaques to form inside the arteries, and that it is beneficial to health to lower cholesterol levels in the blood. We are so accustomed to this line of thinking that it may seem remarkable to discover that the evidence in favor of these presumptions is slim to none, and that practices based on those presumptions may be causing harm rather than aiding health. Nevertheless, that’s what the evidence is. The Institute of Medicine Report, Evaluation of Biomarkers and Surrogate Endpoints in Chronic Disease (IOM 2010), finds that none of the commonly used biomarkers is a valid measure of the illness it supposedly tracks. As to subsequent treatment, Järvinen et al. have pointed out that “There are no valid data on the effectiveness . . . [of] statins, antihypertensives, and bisphosphanates” (the last, e.g. Fosamax, are prescribed against osteoporosis) — British Medical Journal, 342 (2011) doi: 10.1136/bmj.d2175. That last quote is surely an astonishing assertion, given that innumerable individuals are being fed statins and blood-pressure drugs and bisphosphanates not because they feel ill in any way but purely on the basis of levels of biomarkers (bone density in the case of bisphosphanates). That Institute of Medicine Report can be downloaded free at the National Academies Press website, or purchased as a volume of some 336 pages (ISBN 978-0-309-15129-0; ed. Christine M. Micheel & John R. Ball; 2010). The provenance seems as authoritative as one can get, since it was prepared for the Committee on Qualification of Biomarkers and Surrogate Endpoints in Chronic Disease; Board on Health Care Services; Board on Health Sciences Policy; Food and Nutrition Board, under the auspices of the Institute of Medicine, a division of the National Academies, “Advisers to the Nation on Science, Engineering, and Medicine”. 5a. Congress should strengthen the FDA’s [Food and Drug Administration] authority to request and enforce postmarket surveillance across drugs, devices, and biologics when approvals are initially based on putative surrogate endpoint data. What 5a refers to is that drugs and devices are approved on the basis of inadequate trials, so that safety and efficacy could be discovered only after sufficiently large numbers of patients have been exposed to them, but there is no system for monitoring actual performance of drugs and devices once they have been approved. Congress legislated that drug companies must pay the FDA the costs of evaluating requests for initial approval of drugs, but Congress also forbade the FDA from using those funds to monitor performance of the drugs after they have gone into general use. So the possibly fatal “side” effects of drugs become known to the FDA and the public more or less as a matter of chance. There are many examples where knowledge of harm, and later withdrawal off drugs, came only years after some unknown number of individuals had suffered damage, sometimes death. Thus Bayer had their statin (cerivastatin, Baycol) approved in June 1997. Within 4 months, Bayer knew that it could cause rhabdomyolysis — muscle wasting and death. But this risk was not noted in the drug’s package insert for another year-and-a-half, and the drug was withdrawn only in August 2001 (IOM 2010: 205-6), after some hundreds of acknowledged deaths and as many as 100,000 estimated or possible deaths. What 5b means is that the Food and Drug Administration cannot presently safeguard consumers against unwarranted health claims on food packaging, in some part because the validity of the claims is not known. FDA doesn’t have the resources to do the needed studies itself, and has to rely on the product manufacturers for information. 6a. The U.S. Department of Health and Human Services should facilitate a coordinated, department-wide effort to encourage the collection and sharing of data about biomarkers for all uses, including drugs, biologics, devices, and foods. In other words: Even though biomarkers are used universally as measures of health and illness and general physiological status and action, it is not known whether these practices are valid. In fact, they are known to be NOT valid when employed in the manner most relevant to patients. IOM 2010 points out that biomarkers are used in several ways, for example as an initial screening for potentially useful drugs. Biomarkers are known to be associated in some way with certain conditions, so if a potential medication has no effect on a pertinent biomarker, then it is highly unlikely to be of use in treating that condition. There is nothing to criticize about such a use, nor about research on biomarkers. What does matter profoundly is when a biomarker is used to diagnose illness and treatment is based on that biomarker. All that’s generally known about biomarkers is that they are associated in some way, correlated, with some physiological condition. For example, people with higher blood pressure have a higher mortality. But as with all statistical associations, this does not demonstrate cause and effect, it does not demonstrate that high blood pressure causes earlier death. It might be that there is some underlying factor that causes both higher mortality and higher blood pressure. In fact there is: increasing age brings both higher blood pressure and higher mortality. The size of cancer tumors is not a measure of how far the disease has advanced or what the prognosis is. None of the commonly used biomarkers for heart disease are valid indicators of heart disease: not C-reactive protein, not troponin, not overall cholesterol or LDL (“bad” cholesterol) or HDL (“good” cholesterol) — all those are statistically correlated with cardiovascular disease and mortality, but none of them are correlated 100% with those and none of them is indicated to be a cause of heart disease or a contributor to heart disease. In common parlance, biomarkers are often referred to as “risk factors”. Risk factors are nothing more than statistical correlations, they are not actual risks or causes of disease. Thus for CVD, the traditional risk factors are “smoking, hyperlipidemia, high blood pressure, and diabetes mellitus” (IOM 2101: 142), but those have not been shown to be causally related to CVD. For pertinent comparison: Smoking was shown to be a cause of lung cancer not because of the statistical correlation between smoking and lung cancer but only after animals forced to inhale tobacco smoke were found to develop lung cancer. No such direct test of CVD biomarkers is available. in preventing heart disease or to decrease mortality. Similarly with other biomarkers and treatment based on them. That is concluded and stated in the most authoritative official literature.